Hahha Krista, I came visiting today and am now very hungry. It must say something about your work. Yes I would even eat those cute icecream men! adorable, Krista! yummy chocolate and pretzels in a cone…how deliciously cute! Wow, what a great idea! this is beautiful! What fabulous snowmen!!! The expressions on their faces,,the whole concept is marvelous! Now I have to go make myself a banannnna split! ooooooo, Krista I like this even better than the cone! More to love and all. Love the cherry on top, too cute! SWEEEEET! Nice one Krista! Love the triple dip evolution. 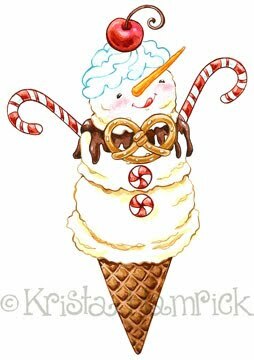 The candy cane arms are a stroke of genius! 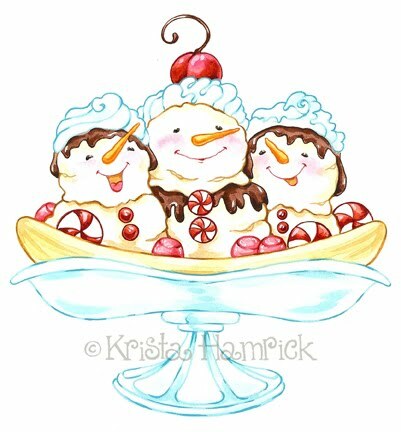 If I ordered the triple scoop sunday and it came looking like this, I couldn’t eat it….it’s too cute! Well maybe not right away :o) Your snowmen are the best!! I love these! They are too cute to be eaten. They are wonderful! Very chamring. Thanks for sharing and enjoy the long weekend!